The Cleveland Cavaliers have had quite the ride this season, experiencing a long winning streak, bad losses, a locker room at a point completely falling apart, and then perhaps the biggest midseason turnover of a roster we’ve ever seen. By adding four new rotational players Cleveland went from being in danger of not having homecourt advantage in the first round, to once again be the favorites to make it back to the finals for the fourth straight year. Furthermore, it looks like the team is once again having fun on the court and enjoying playing together, something that had been missing for the entire season. One thing that stood out in their offense is LeBron’s newfound love for setting ball screens and suddenly he’s getting easier shots by letting the offense work for him. LeBron’s screens often benefit George Hill, a player that reads the floor very well, is an accurate passer and makes great decisions most of the time, which also tend to end in plays that set LeBron up for easy shots. LeBron and Hill have already developed some good chemistry. Hill’s shooting is opening up the floor and LeBron is taking advantage of that to come through in unique ways to hit open shots. Hill’s pick-and-roll skills are quite underrated as he knows how to change speeds, put his defender in jail, and patiently wait for the best shot to present itself. The recently acquired Larry Nance, a former Laker, is also a good ball screener who rolls to the rim hard and gives them a great finishing ability. His hard rolls and the threat of monster dunks keep defenses occupied and create additional space for shooters. He’s also a huge help for the Cavs in the offensive rebounding department as he’s a tireless worker down low that constantly crashes the glass to extend the possession and increase Cleveland’s opportunities of beating the good teams. Due to his familiarity with Jordan Clarkson, also recently acquired from the Lakers in the same trade, Nance can display some decent high post passing skills as well, which adds another dimension to the Cavaliers game and allows their offense to get more ball movement and easier shots. In fact, Clarkson has been a revelation in the backcourt for the Cavs, especially compared to what they used to get from Dwayne Wade and Derrick Rose. With the shooters that the Cavaliers have, Clarkson will have plenty of room to aggressively get penetration in the paint for strong finishes at the rim. He has really good moves off the dribble and has not been shy about making things happen, which also serves to occasionally give LeBron a much-needed rest. His talent to make and create shots off the dribble is key for the Cavaliers and if he can keep it up their offense will be very tough to stop, even when LeBron is on the bench. The Clarkson-James pairing is also key for the Cavaliers, as Clarkson’s aggressiveness has been creating easy shots for LeBron in ways not seen before the trade. This also happens because he’s willing to share the ball with his open teammates when he senses his drives are hitting a dead end. Rodney Hood another recent addition, from the Utah Jazz, has so far been a huge contributor scoring-wise. He was shooting well in Utah, but so far in Cleveland he’s been scorching hot. Hood has been attempting seven shots per game in 21 and a half minutes per game and so far, he’s been making 50 percent of them. 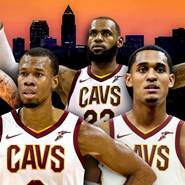 In other words, the new players have fit in very nicely and are playing quite well together, even when LeBron’s is on the bench, giving head coach Tyronne Lue a ton of options and flexibility. The only outstanding issue is how the injured Kevin Love will adapt to his new teammates and whether his presence on the floor will disrupt the Cavs’ newfound chemistry. But that’s a good problem to have as the Cavs are right back in the thick of things in the Eastern Conference and have regained their status as the favorites to return to the NBA Finals.